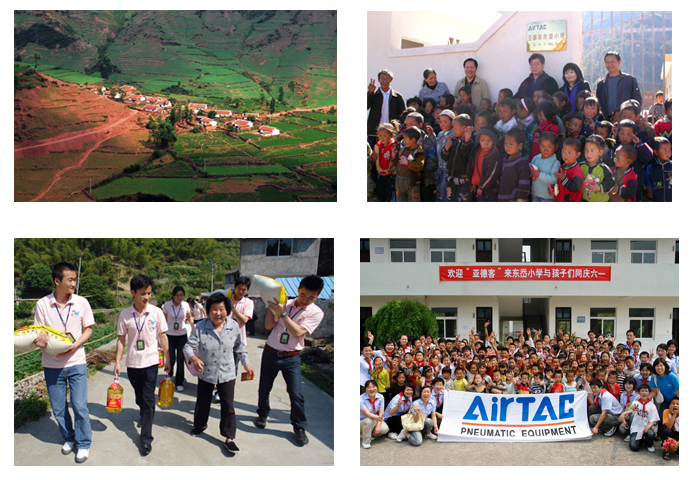 AirTAC’s philanthropy mainly includes Sunshine Actions and Blue Education Assistance Project. With the principle of “concern about poverty-stricken areas, care for unprivileged people and making contributions to the social progress”, the Sunshine Actions are aimed to continuously promoting the charity work. The activities include the renovations of villages and infrastructure, large-scale charity work themed with “Sunshine Actions”, long-term support to families in need, donations, blood donation without payment, tree-planting, litter picking… With the mission of concerning about the students’ healthy growth and helping the unprivileged students to accomplish their education, the blue education assistance project carries out various charity activities in elementary and secondary schools as well as colleges and universities. The activities include Education Fund, Youmei Education Fund, Pearl Class, AirTAC Class, teaching, renovation of domestic installations, etc.